Cheap character LCDs based on the HD44780 chipset come in a variety of sizes: 2×16, 4×20, etc. These displays have two standard interface modes, 4bit and 8bit parallel. 8bit requires a total of 11 data lines, 4bit requires 7 (6 for write-only). Some LCDs support an additional serial data mode, like the VFD Ian covered at Hack a Day. HD44780 LCDs are generally 5volt parts with a separate supply for the back light. The Bus Pirate only has five 5volt tolerant I/O pins, so we made a small adapter board with enough pins to control the LCD. The Bus Pirate controls the adapter board through its LCD interface library. Continue reading about the Bus Pirate HD44780 character LCD adapter board and interface library after the break. We can have PCBs, kits, or assembled kits produced by Seeed Studio for about $15, including worldwide shipping, more here. In this article we outline an I2C adapter board for HD44780-based LCDs. We demonstrate it with a Bus Pirate universal serial interface. The Bus Pirate source code for the I2C-based HD44780 interface library is public domain, so it’s free to adapt to your own projects. Full size circuit image [PNG]. The circuit and PCB were designed with the free version of Cadsoft Eagle. The design files can be downloaded from the Bus Pirate SVN. Before using the adapter board, be sure to verify the datasheet for your LCD against the adapter pinout. Not all LCDs are the same. This is a simple 8 I/O expander chip that’s controlled through the two-wire I2C interface. 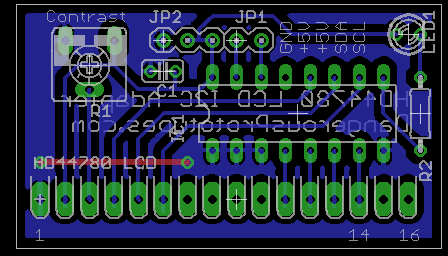 The I2C interface is accessible from header JP1. The PCF8574 works from 2.5 to 5volts. The I/O pins operate at the supply voltage, so if we feed it 5volts it interfaces the LCD at 5volts. C1 (0.1uF) decouples the IC from fluctuations in the power supply. One pin of the PCF8574 controls a 3mm LED (LED1) through current limiting resistor R2 (1000 ohms). The LED lights to indicate successful communication between the Bus Pirate and the adapter. The PCF8574 can’t source enough current to power the LED, so we power the LED from the 5volt supply and switch the ground. The adapter board communicates with an HD44780-based character LCD in 4bit parallel interface mode. 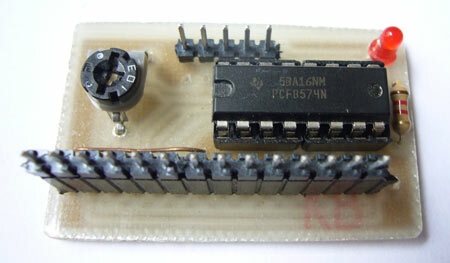 The 4bit interface pins – RS, RW, EN, and D4-D7 – are connected to seven of the PCF8574 I/O pins. We like to use 0.1″ male pin header to connect the adapter to an LCD, you can usually lean the LCD against the pins to create sufficient contact for a quick test. Trimmer resistor R1 (10K) provides a contrast adjustment voltage to pin 3 of the LCD header. We didn’t connect the backlight pins because there’s so many different backlight styles. Providing power for an LED backlight might damage a screen that requires a negative voltage supply. Most LCDs require 5volts, provide an external power supply through header JP2. We provided a second power supply pin to connect the Bus Pirate’s pull-up resistors. 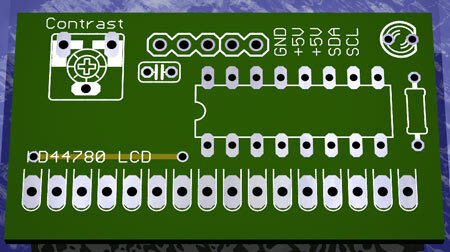 The circuit and PCB were designed with the free version of Cadsoft Eagle. The design files can be downloaded from the Bus Pirate SVN. The PCB is a single-sided, all through-hole design with a single jumper wire (shown in red). We can have PCBs, kits, or assembled kits produced by Seeed Studio for about $15, including worldwide shipping, more here. Bus: 4bit parallel, with PCF8574 I2C adapter board. References: example datasheet [PDF], HD44780 command reference, HD44780 LCD uber-site. Complete Bus Pirate session log for this demonstration. We designed the adapter for the LCD library of the Bus Pirate universal serial interface, but it’ll work with anything that can speak the I2C protocol. Take a look at the Bus Pirate source code for an example I2C->HD44780 implementation. Connect the Bus Pirate to the adapter board as shown in the table. The table also shows the raw connections to the PCF8574 IC if you’re following along without an adapter board. Connect the adapter to a power supply sufficient for the LCD, generally 5volts. The I2C connection between the adapter and the Bus Pirate requires pull-up resistors between 2 and 10K. Here’s more information about mixed voltage interfacing with pull-ups, and the Bus Pirate on-board pull-up resistors. We’ve covered the adapter design and how to connect it to the Bus Pirate, now it’s finally time to write something to the LCD. Press ‘m’ in the Bus Pirate terminal and choose the LCD library. It currently it only supports HD44780 character LCDs using the PFC8574 adapter described in the first half of this article (option 1). Enable the power supplies (big ‘W’) and pull-up resistors (menu ‘p’). Check the voltage monitor (menu ‘v’) and make sure that the pull-up voltage (Vpullup) reads around 5volts. This table outlines the single-byte commands that control an HD44780 LCD, here’s a detailed reference. These commands can be entered from the Bus Pirate command line, but we’ve made macros for most of them to save time. Macro 0 displays the macro menu for any Bus Pirate mode. The initialize LCD macro (2) configures the screen for 4bit interface mode, enables cursor display, and sets a few other helpful options. Configure the number of display lines, choose 1 for a single line display, or 2 for all other displays. After initialization, the screen should be clear with a cursor visible in the corner. If it didn’t work, check the I2C connection, pull-up resistors, and power supply, then try again. HD44780 LCDs need to be reset with a special signal sequence before they can be initialized for 4bit or 8bit interface mode. Macro 1 creates this sequence. Macro 2 includes the reset sequence, so there’s no need to use macro 1 before macro 2. The write numbers macro fills the LCD with test numbers between 0 and 9. The number after the colon tells the Bus Pirate how many test numbers to write, we’re using a 4x20LCD, so we write 80 numbers to fill it. Notice that the cursor ends at position 0, under the first ‘0’. The write characters macro fills the LCD with ASCII characters, enter the quantity after the colon. Notice that the fist line continues on the third, the third on the second, and the second on the last. The characters aren’t continuous because character LCDs don’t wrap from one line to the next. We’ll talk a little more about this in step 5. The clear LCD macro sends the HD44780 command that erases the screen and returns the cursor to the first position. You could also do any of these operations without the macros, refer to the command table at the beginning of this section. Enter ‘[0b1’ in the Bus Pirate to set the interface to command mode ([) and send the HD44780 clear screen command (0b00000001) without a macro. Enter text to insert at the cursor position. After clearing the LCD in step 4, the cursor is positioned at the first block. We could also set it with the macro (4:0), which moves the cursor to the first character. The insert text at cursor macro asks for text input, and then copies it to the LCD when you press enter. Writing to the second line is a little more complicated, it actually starts at character 64 on a 4×20 LCD. If you continue writing from the end of line 1 (character 20) then you’ll end up at the beginning of line three! This page has a nice collection of memory maps for most character LCD sizes. First, we position the cursor on the second line (4:0x40). Next, the ‘insert text’ macro grabs our input and copies it to the LCD. The Bus Pirate accepts multiple macros on the same line, so the entire screen can be written at once. We wrote to the last two lines with a single line of syntax. We could use ‘(3)(4:0)(8)(4:0x40)(8)(4:0x14)(8)(4:0x54)(8)’ to clear the LCD and write all four lines with a single syntax entry. 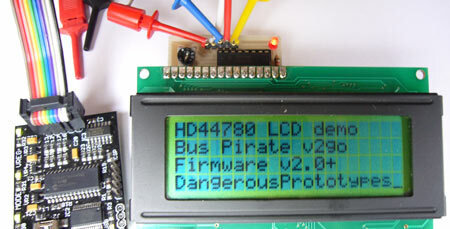 The Bus Pirate and LCD adapter board can read from the LCD. We’ll read the text we wrote to the screen (DDRAM), but you can also read settings and custom character ram (CGRAM) by setting the correct address. First, we tell the Bus Pirate to send data to the LCD command register ([). Next, we use the set DDRAM address command (0b1xxxxxxx) to set the read pointer to the beginning of the DDRAM (xxxxxxx=0000000). Finally, tell the Bus Pirate to read from data memory (]), and then read a few bytes (rrrrrrr). We got “HD44780”, the text we wrote to the screen in step 5. You should also be able to use the shortcut r:7 to read seven bytes, but it’s not working in the current firmware – we’ll fix this prior to the next release. The HD44780 character LCD adapter is a handy accessory for the Bus Pirate. It can be used for a quick test, or more advanced logic development. In addition to LCDs, the eight 2.5volt-5volt I/O pins might be useful for other high pin-count Bus Pirate applications. This entry was posted on Thursday, August 13th, 2009 at 3:00 pm	and is filed under Bus Pirate, Bus Pirate accessories, Prototypes. You can follow any responses to this entry through the RSS 2.0 feed. You can skip to the end and leave a response. Pinging is currently not allowed. can any one please tell me the commands to display on 2nd, 3rd and, 4th lines of a 16×4 lcd module. i searched it on internet a lot but cant find it :-( . please help me. Do you mean with the Bus Pirate, or just in general? This article and the sites linked (eg http://homepage.hispeed.ch/peterfleury/avr-lcd44780.html ) describe how to do it. No i mean i want to know about Commands. as we use the command 0c0H in a 16×2 LCD to force the cursor to the beginning of 2nd line. like wise what will be the commands for 16×4 LCD or 20×4 lcd modules to force the cursor to their 2nd, 3rd and 4th lines. If you have any further questions please ask in our forum, it’s nor really relevant to this old forum post. Hi, Im wondering of doing the oposite.. How could It be done? Is there any interface I could get hold off? Would gladly pay someone to get this done for me a reasonable Price. Outputs that go to LCD and redirect them with cables to a small i2c oled screen. Hello,can I use this with any board?I have a board that its lcd is I2C and its lcd is broken.Can I replace it with this tiny board? Thanks in advance!